Data visualizations are much more than pretty pictures. Ed Hawkins' spiral graphs carry readers to knowledge. Data format is an important component to comprehension. 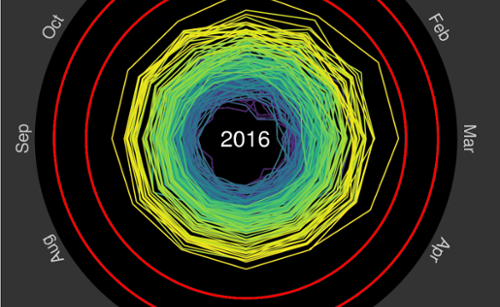 Spiral graphs bring climate data to life. Accelerating climate change is easily discernable. A good data visualization is like a bridge to knowledge. Staid statistical renderings can fall flat, and fail to get the point across. But place the information in the proper visual frame and the reader is transported from ignorance to insight. When the information to convey rises in importance, the need to connect with the viewer compounds. Data about climate change, for instance, are arguably some of the most important facts to communicate. Couched inappropriately, they can miss the mark. That’s not a problem for the spiral graphs Ed Hawkins has created. Hawkins’ work hits the bullseye. Hawkins is an associate professor in the Department of Meteorology at the University of Reading. To create a bridge to knowledge, he compiles historically collected weather data – temperatures, C02, sea ice levels, and more – and portrays them in an outward spiraling form. One method to convey the temperature rise since 1850 is to say, ‘Hey, global temperatures have risen 2º C (3.6º F) since 1850.’ Or one could, as Hawkins has done, use a widening gyre to show what the world temperatures since 1850 look like. Which do you find more compelling? In the spiral graphs, one can see events such as the strong El Niño event of 1877-78, a volcanically-induced cooling trend during the 1880s-1910. More recently, the spirals clearly show a strong warming trend from the 1980s till the present. Hawkins’ work was featured at the Rio 2016 Olympic games, and was placed on the shortlist for the Information is Beautiful awards. This attention for Hawkins is well-deserved, not least for his ability to educate us. His spiral bridges to knowledge will carry many to a new understanding of the accelerating changes occuring to our climate.